Quilling is a paper craft that has been around for hundreds of years and is still popular today. Rolling paper strips into beautiful works of art is easy enough even for beginners to achieve impressive results. You don't have to spend a lot of money to get started with this craft either. All you need is paper, glue and a round object such as a toothpick or a bamboo skewer to curl the paper strips. If you get bitten by the quilling bug, you can purchase tools such as a quilling pen, comb, crimper and more, but you can make incredible projects with just the basics. Many crafters make quilled monograms to give as wedding gifts, or to use as wall decor. The famous Yulia Brodskaya is the graphic designer turned paper artist who initially started the quilled monogram craze. Her original works were an inspiration and started an entirely new art form–turning typeface into typographical quilled art design. Yulia's artwork is highly prized and is "owned by Oprah Winfrey, Ferrero, Hermés, San Francisco Museum of Modern Art, Hermes, Paramount Pictures, Country Music Association, Wimbledon, Mr Issey Miyake and numerous private collectors." Print your letter of choice in a light gray color onto the cardstock background. An alternative method is to print the letter filled with black onto a sheet of paper, and then place the black letter print behind the piece of paper you plan to use as the monogram background. Place both sheets against a window and trace the letter with a pencil by hand onto the cardstock background. Make straight lines with a ruler and pencil tracing over the transfer pencil marks. Erase any dark or stray pencil marks. Choose cardstock in colors you plan to incorporate into your design. Cut one-quarter inch wide paper strips with a paper cutter from the colored cardstock. You can buy precut quilling strips online or at the craft store if you want to skip this step. The choice is yours! Decide what the design of the inside of your letter will be. It helps to look at photos for inspiration and make a preliminary quick thumbnail sketch for the layout of your monogram. Make your shapes using a toothpick or quilling tool. Take your paper strip and wind it around your toothpick into the shape desired. Place a bit of glue onto the end of the paper strip to hold the shape in place. If you want a tighter more compact paper shape, roll it tightly. If you want a looser paper shape, roll it loosely. It is a good idea to practice making different shapes until you get the hang of it. It takes some effort and patience to master the art of paper quilling, but if you are persistent, you will quickly be making lovely works of art. There is one important concept to remember when gluing your quilling strips: "Less is more" is the number one rule when it comes to gluing quilling strips to your baseboard. Too much glue can ruin your project, so be careful. Some people use a small brush to apply glue to the bottom of the quilling strips and then place and hold the strips onto the background until the paper pieces can stand up on their own. Other people find that placing the quilling strips onto a paper plate with glue and then placing on the background works better for them. You have to practice and decide which method works for you. Just remember to use a light touch when applying the adhesive to your paper strips. The most important step of the quilled monogram process is to build a paper frame around your letter. Glue and place your strips, holding them until the glue is firm enough for the strip to stand up on its own. Make sure to have a one-quarter inch overlap on the ends of the paper strips, and secure the strips with a drop of glue. Allow the "wall" of your quilled monogram to dry thoroughly before proceeding to the next step. Once you have built your outside frame, it is time to fill in the insides of your monogram. Follow the design in your sketch and glue your shapes and strips into place. Allow the finished piece to dry completely for a few hours. Tweezers are one of the most important tools you will use. It can be especially difficult to place quilled paper shapes into small spaces inside your quilled monogram project. Tweezers will go where your fingers cannot, saving you time and alleviating frustration. 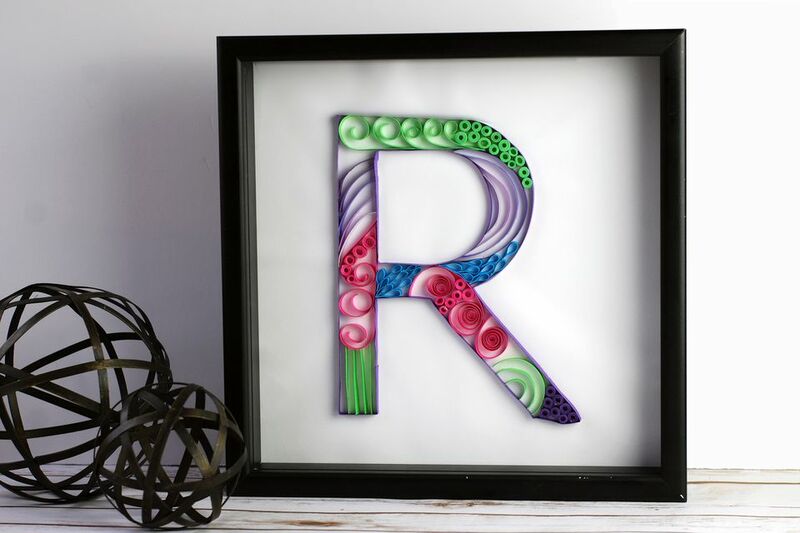 After you have finished your project, you will want to place your quilled monogram into a frame. If you use a regular picture frame you will have to remove the protective glass from the front. There simply isn't enough room to allow for the raised surface of the quilled paper in a standard frame. If having the piece protected by the glass is important to you, you will find that a shadowbox frame will solve your problems. Shadowbox frames have an inch or more depth under the protective glass and are perfect to frame your quilled art piece. 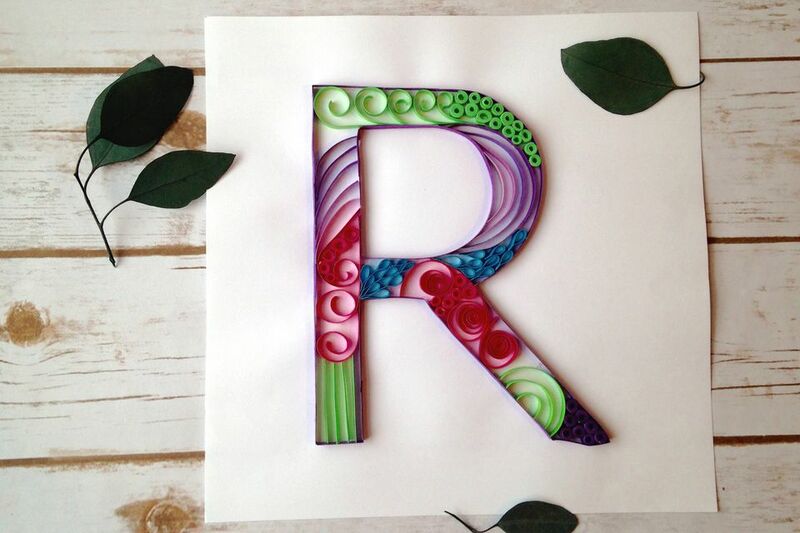 This tutorial covers quilled alphabet letters, but you can do so much more with the art of quilling. You can make flowers, embellish cards and even make jewelry. If you love quilling, make sure to try other types of quilling projects and techniques. With time, practice and a little bit of patience, you will soon become a paper artist making beautiful works of paper art for yourself and your friends.